I’m no certified writing expert: let’s just get that admission over with. I “only” have a bachelor’s degree, and I have not had a lot of time to pursue writing professionally up to this point. However, I have years and years of experience with writing and literature–honestly, so many that I find it impossible to truly count them–and significant experience as a copyeditor. (That is, I consider it significant, as I have reached a point at which I feel absolutely confident in my editing.) I am a talented writer, and I read a lot. In professionally published writing, I do not usually see the problems about which I intend to speak. This advice is geared particularly toward internet writing. These days, anyone who wants to can go online, to various platforms such as our lovely WordPress here, or create a website, or even hop on twitter. People can write absolutely anything they want and put it out there for hundreds or even thousands (and, in rare cases, millions) of others to read. I do think that is fantastic. It is at this moment the only outlet I have for my writing, although I am really trying harder to create more opportunities for myself to write. However, in that wonderful freedom lies an extremely irritating problem. While you can publish any written piece you want online, whether it be 140 characters or 50,000 words, you might want to just take a moment to proofread your thoughts before you click on that “post” button. I suppose everyone should feel free to post rambling, ignorant, or substance-less writing if that’s how they choose to express themselves. I’m not complaining about the content–that’s just freedom of speech, man! (I find myself saying “man” a lot lately. Mostly when talking to myself. I’m not sure why.) But when you don’t know the rules of grammar, why do you think this is the best way to convey your thoughts to others? If I’m looking over a very thoughtful blog post and all of a sudden I come across a glaring grammar mistake, it kind of just ruins the experience. With that in mind, I have just a few small tips for you to start off with. The first piece of advice I have for you is to read. Find something you enjoy reading and read a lot of it. It can be incredibly helpful to develop your writing style and voice to just absorb properly edited, published writing. I honestly think that is how I learned a lot about grammar and using language. Second: KNOW YOUR APOSTROPHES. I’m not going to rant on and on about their, there, and they’re, because I’m sure you’ve all heard that one before. I even recall reading over a blog post before publishing it to find that I’d somehow substituted one for another (see, proofreading is your friend! ), and that was quite recent. However, the one that I can never seem to get over is its and it’s. I suppose I understand why people get confused there. Using specific nouns, the possessive always uses an apostrophe. I would really like everyone to please learn, however, that when you’re using pronouns, if there is an apostrophe in the word, it is NOT a possessive form, but a contraction. It’s means “it is.” Please, please stop confusing them, it really is one of the biggest day-to-day frustrations for me in terms of reading anything printed on the internet. I have even seen this mistake in advertisements, and that makes me sad. Don’t advertise your business with incorrect grammar, please. While I’m talking about apostrophes, I want to tell you that the correct way to write about a decade would be, for example, “the 1950s.” If you have written “1950’s,” then your thought in fact says “of 1950.” You need to know this. It’s important. If you are abbreviating the number, then you would use an apostrophe: the ’50s. It’s not confusing, really, even if it seems that way. If you don’t like oxford commas, you can rearrange word order to avoid confusion. “We invited JFK, Stalin and the strippers” does not have the same potential for horrible (or awesome?) mental images. I think this is long enough for one post, but I can post more writing advice in the future if anyone finds my thoughts helpful. To close, I want to say this: I am not writing this to mock people who don’t have a talent for writing, or to pretend I’m the queen of grammar, or anything else like that. I understand also that each person’s grammar skills can be affected by their background, their education, and the speaking and writing habits of their family and friends. I do not think, however, that basic grammar is difficult to learn; I think it is possible for most people. It’s about how you present yourself. Potential and present employers, college admissions, other writers and bloggers and people out there reading what you have chosen to show them … none of these people are going to take you seriously if you publish writing with such simple mistakes in it. Have enough respect for yourself to make your writing better. This entry was posted in about writing, blog and tagged advice, apostrophes, blogging, copy, grammar, internet, learning, practice, reading, writing. Bookmark the permalink. 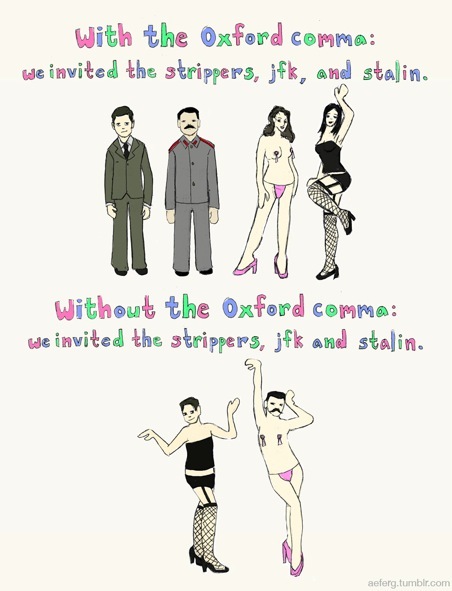 Sometimes I will use the oxford comma, but to me it seems redundant. I usually use it. My thoughts are that it’s not necessary for simple lists, but lists involving more complex thoughts need it. I like commas breaking up my sentences.